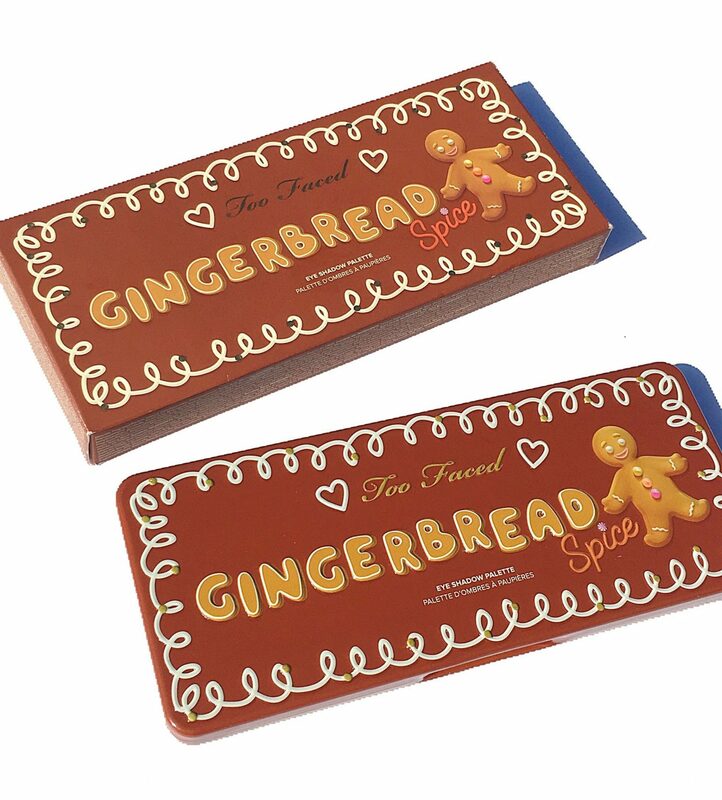 The Too Faced Gingerbread Spice Eye Shadow Palette was something I immediately lusted for after images of it surfaced online. 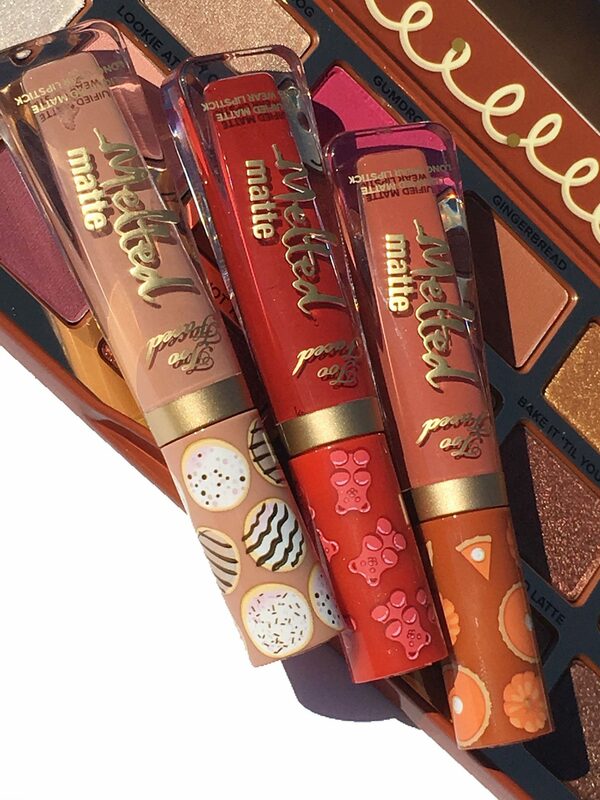 A deliciously scented palette with warm toasty shades in multi-colored finishes? Who could resist? 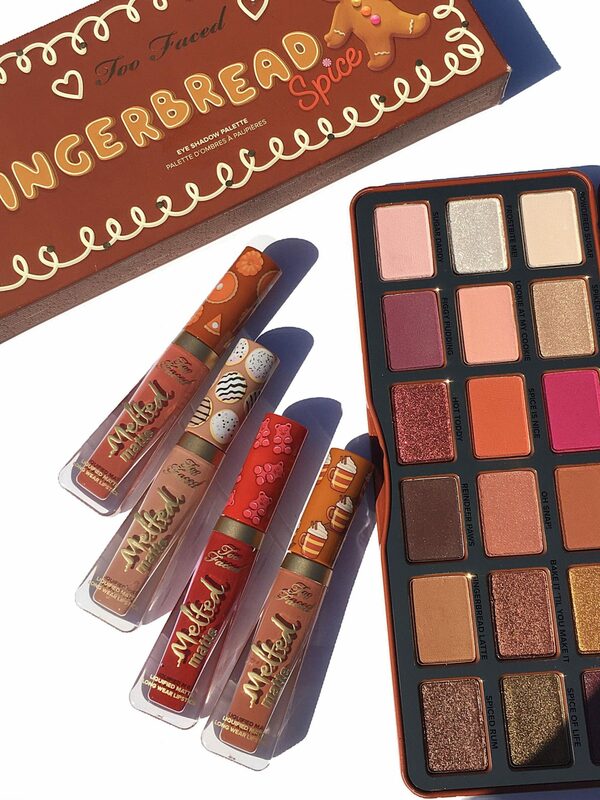 I picked up the palette along with the Sweet Smell of Christmas Mini Melted Liquid lipstick set online. Today I’ll be sharing more details and swatches, so let’s dive in! The palette contains 18 multi-finish shadows that are ultra pigmented, with a creamy texture with incredible pay off. Although the palette is described as having a gingerbread scent, to me it smells more like the scent of a yummy vanilla cookie. If you are partial to warm hued color themes, I suspect you will fall in love with this one. The color range screams Fall. 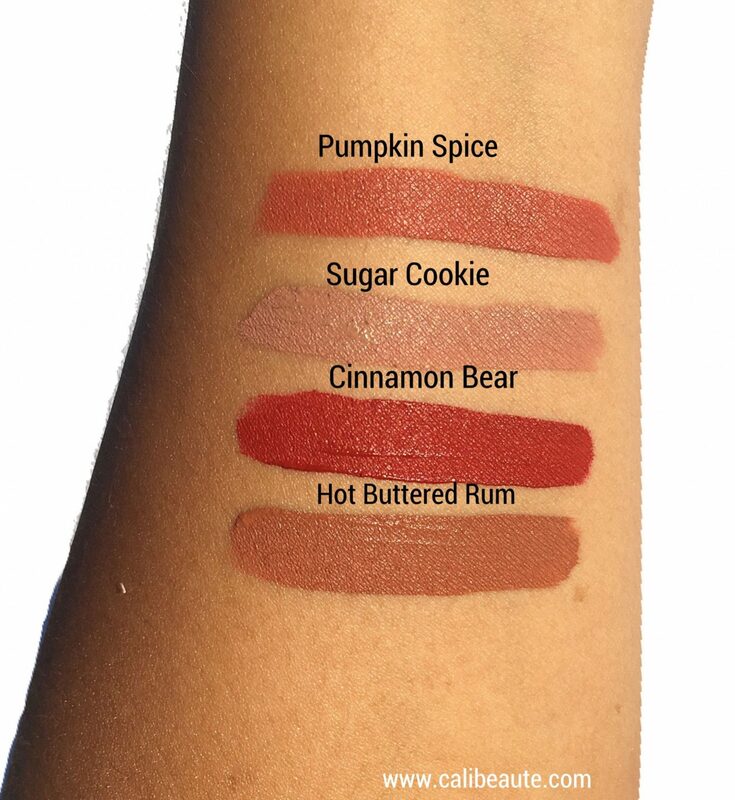 The colors are extremely pigmented when swatched! The colors that I swatched above were done on my bare skin with no primer. As you can see the colors show up beautifully. Of the colors I’ve worn so far, they applied smoothly, and were easy to work with using a combination of my small eyeshadow and blending brushes. 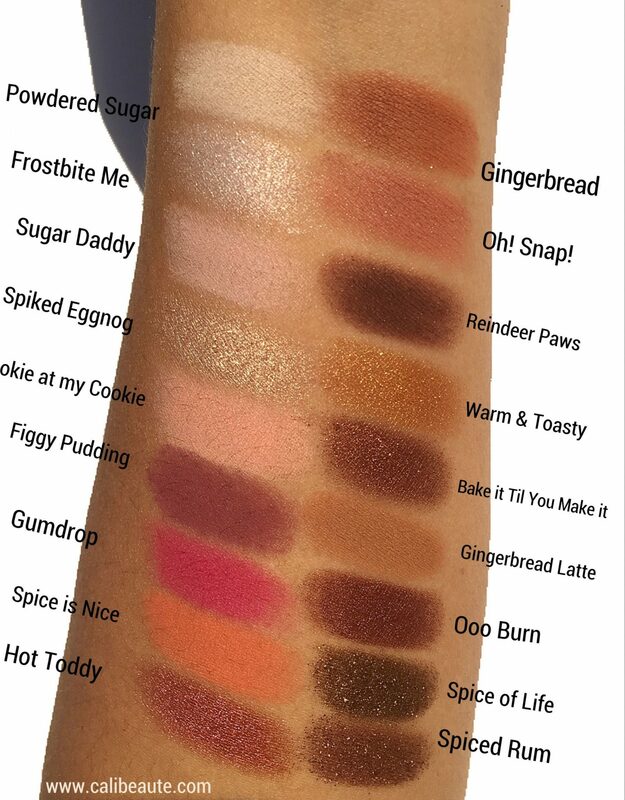 My favorite shades from the palette and the most used so far are: powdered sugar (for my brow bone), Gingerbread, Oh Snap, Spice is Nice, Hot Toddy, and Figgy Pudding. Gumdrop is the only shade a little out of my comfort zone, but all the other colors are so wearable. There are so many endless possibilities with this palette. The lasting power is amazing (no primer needed for me) Bottom line, it was a clear winner for me. 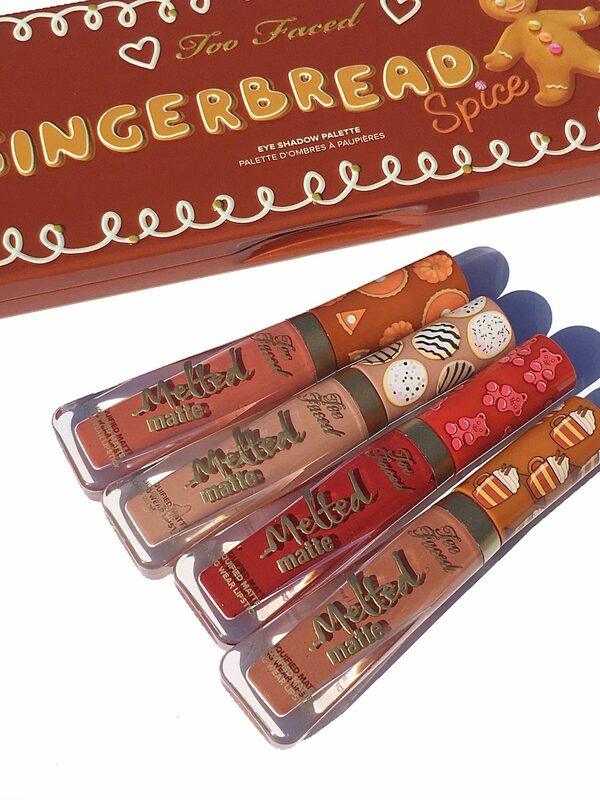 The perfect item to complement the palette is the Sweet Smell of Christmas Treats Mini Melted Liquid Lip Set (say that fast ten times ) It’s a tongue twister of sorts, but this set will not disappoint! 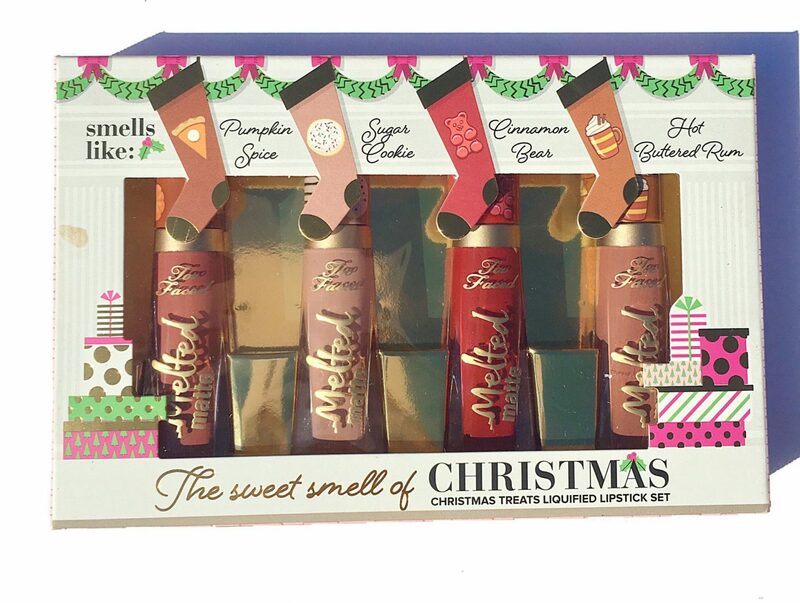 Priced at a steal at $25, this stocking-sized collection of mini Melted Matte Liquid Lipsticks come in yummy Christmas scents. 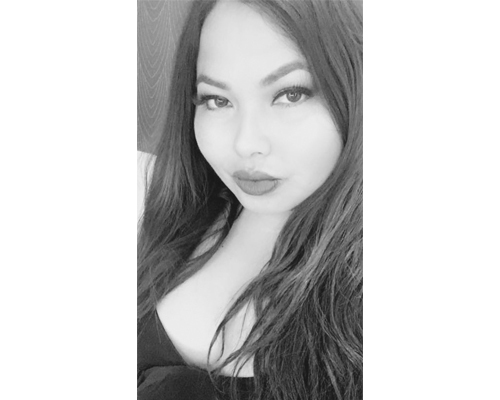 I have purchased many of their holiday lip kit offerings through the years and this is my favorite thus far! The shades complement the palette perfectly. 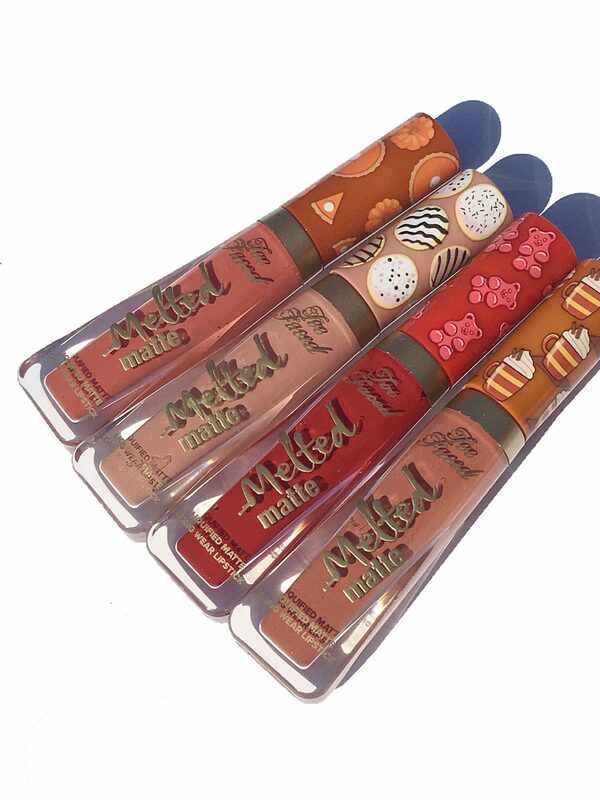 I have reviewed the Melted Matte Liquid Lipstick formula several times on my blog and it’s one of my favorites. It glides over my lips like a gloss but dries to an ultra-matte opaque finish. It’s lightweight, long lasting, and feels comfortable throughout the day. This would make a great gift for any beauty lover. The holiday season will no doubt be saturated with many holiday releases and offerings. If you’re like me, you want as much bang for your buck and you want products that perform. I am happy to report that I am very pleased with my purchase and plan on purchasing two more lip kits as gifts. I hope that this post was helpful. 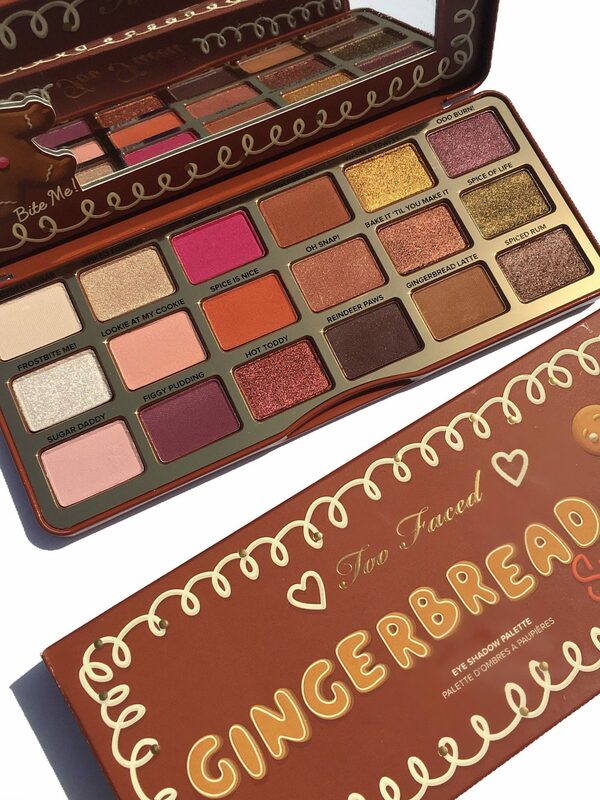 The Too Faced Gingerbread Spice Palette and Mini Sweet Treat Melted Liquid Lipstick set is now available at Sephora, Ulta, Macys, and the Too Faced website. Is this on your list? 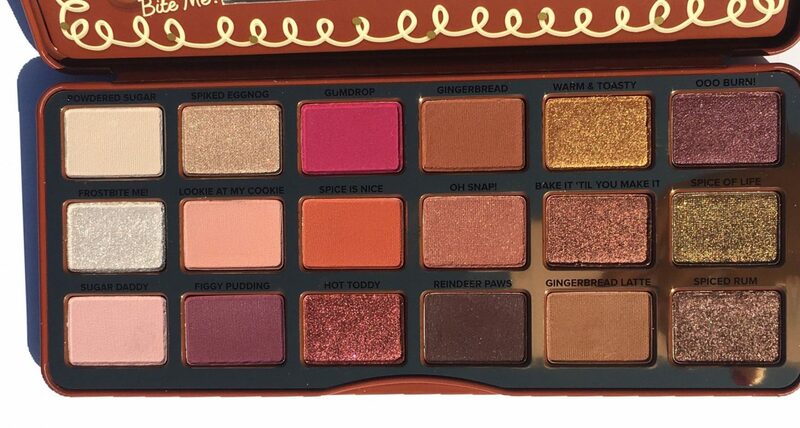 Or do you have other Too Faced Holiday offerings in mind? These products were purchased by me. This post may contain affiliate links. Please read the disclosure on my home page for details.